The Bohemian Club’s all-male membership includes artists, particularly musicians, as well as many prominent business leaders, government officials (including many former U.S. presidents), senior media executives, and people of power Members may invite guests to the Grove although those guests are subject to a screening procedure. A guest’s first glimpse of the Grove typically is during the “Spring Jinks” in June, preceding the main July encampment. Bohemian club members can schedule private day-use events at the Grove any time it is not being used for Club-wide purposes, and are allowed at these times to bring spouses, family and friends, though female and minor guests must be off the property by 9 or 10 p.m. After 40 years of membership the men earn “Old Guard” status, giving them reserved seating at the Grove’s daily talks, as well as other perquisites. The Club motto is “Weaving Spiders Come Not Here,” which implies that outside concerns and business deals are to be left outside. When gathered in groups, Bohemians usually adhere to the injunction, though discussion of business often occurs between pairs of members. Important political and business deals have been developed at the Grove. The Grove is particularly famous for a Manhattan Project planning meeting that took place there in September 1942, which subsequently led to the atomic bomb. Those attending this meeting, apart from Ernest Lawrence and military officials, included the president of Harvard and representatives of Standard Oil and General Electric. Grove members take particular pride in this event and often relate the story to new attendees. The main encampment area consists of 160 acres (0.65 km2) of old-growth redwood trees over 1,000 years old, with some trees exceeding 300 feet (90 m) in height. The primary activities taking place at the Grove are varied and expansive entertainment, such as a grand main stage and a smaller, more intimate stage. 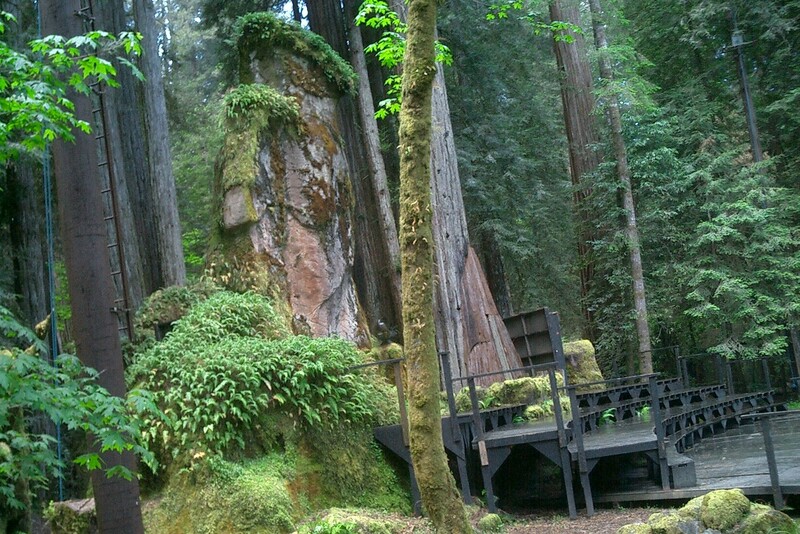 Thus, the majority of common facilities are entertainment venues, interspersed among the giant redwoods. Bohemian Grove conspiracy theorists were saying that the rich and powerful met every year in the woods and worshiped a giant stone owl in an occult fashion. It turns out, ABC, CBS, NBC, and many other credible news agencies investigated this and found out, its true. It is said to be just all fun and games, like brotherhood style fraternity stuff.